In the past week I’ve been incredibly itchy. It started off with the bottom of my feet and then my hands. I would itch, scratch and what felt like relief as I ripped my skin to pieces trying to get rid of the itch. It started after coming out of the shower. But now, it’s just before bed, during the night and when I wake up in the morning. I want to scratch and scratch until my skin bleeds for instant relief. There’s no rash, no signs to prove that’s there’s an itch to scratch, just that I need to and I need to do it now. On Wednesday I was supposed to discuss my birth plan with my midwife, even got Sam to leave work early to come to the appointment so we can get plans in place for potential tours of units and to know what’s what when the time comes. 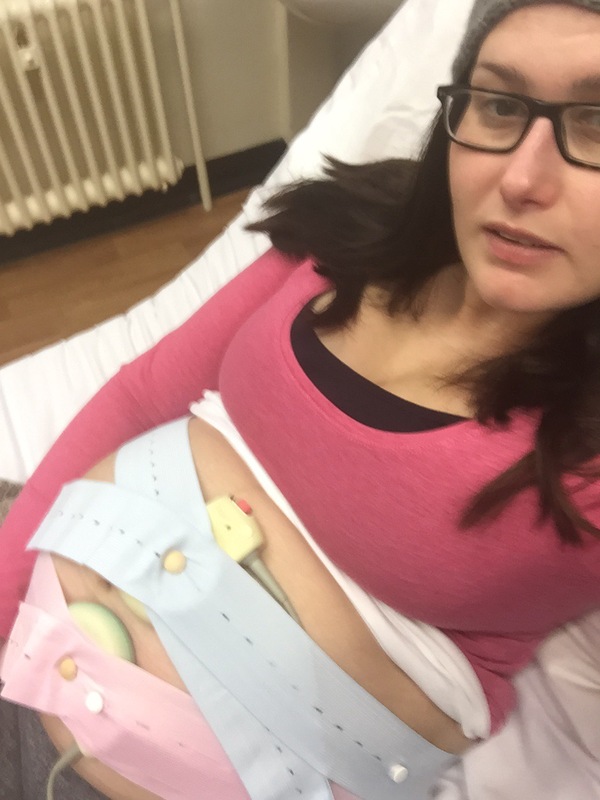 But because this pregnancy can’t just be normal, my itching became a concern with my midwife. Rather be safe than sorry, blood tests were taken and fast forward 2 days later and I’m now lying on a bed on the daycare until, strapped up to a machine monitoring Missy’s heart rate, gasping for some water, arm drained of the further 2 blood tests taken, with a handy guide explaining what all this could be, shattered beyond belief, waiting for my results and news to come. Itching is common during pregnancy and can start at any time but usually starts after 28 weeks. With concerns about my itching, I’m being tested for Obstetric Cholestasis. Hormones such as estrogens, levels of which are higher in pregnancy, may affect the way your liver works and cause OC. OC is more common and women from a certain ethnic groups. Further evidence for genetic component is OC appears to run in some families. If you have suffered from OC, there is a risk of recurrence in a future pregnancy. It can mean two things. So what does that mean for my baby? There is an increased chance that your baby may pass meconium (move it’s bowels) before being born. There is an increased chance of a premature birth. So whilst I sit here lying on this bed strapped up to this machine, with cotton wool covering my arms from the excessive need to take out blood, I await my results hoping that the results rule out abnormal liver functions. So far I’ve had 4 vials of blood taken in the past 72 hours. The last 2 blood tests came from a healthy vain and the most recent from a serious amount of hand pumping action to force the needle through- painful to be truthful. Depending on my results from the lab and what the doctor says, the extra care I’ll need varies. I may need an ultrasound scan to check for liver abnormalities and gallstones. I would need to be put under the care of a consultant and have my baby in a consultant-led unit within a neonatal unit. It will be likely to have a liver function test (1-2 per week) right up until I have my baby. Additional monitoring of your baby may include monitoring heart rate and ultrasound scans for growth measuring the amount of fluid around the baby. When in labour you will be offered continuous monitoring of your baby’s heart rate. So, the big question is, can it be treated? The only cure for OC is the birth of your baby. Thankfully no treatments received affect the outcome of your baby. Skin creams and ointments to relieve the itching. Antihistamines that may help you sleep at night. Ursodeoxycholic acid also known as Urso that helps reduce the level of bile acids on your blood. Recommendations to wear loose clothing and having cool baths to deacrease the itchy feelings. The midwife has explained to me that if the results return that I have OC I won’t be able to go beyond my due date. The option to discuss having labour induced after 37 weeks (which for me is tomorrow) if my symptoms are severe all my blood test results are abnormal is something to consider. Early induction (before 37 weeks) may carry an increased chance of Caesarian section and an increased change of your baby being admitted to the special carecbaby unit. Whatever the results, the doctor will discuss with you your individual situation so that you can make an informed choice. After your baby has arrived, a follow-up appointment with a healthcare professional with knowledge of OC 6-8 weeks after birth is recommended. This will be to check that OC has stopped- itching has gone away and your liver is working fine. But tests may be recommended to keep an eye on your liver functions which, if is another matter will be referred onto a specialist.